Beads from my fabulous husband! I made this ages and ages and ages ago, but just remembered that it is hanging around in my hand bag ready for photographing! (sorry about the abysmal quality - I'm using the camera on my phone). Simon found these beads for me (the Peruvian ones and the gorgeous hexagonal silver ones) while he was in San Francisco last year. This is not something I would usually wear from both a style and colour scheme perspective, but I really love this necklace! 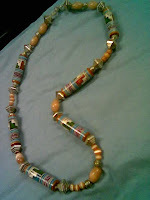 I made this necklace a couple of weeks ago, before I had all the right materials! Despite that, I'm really pleased with it! However, now that I have some lovely lightweight red wire, I will re-do this one and use the red where I've used silver on this one. I think the silver makes it look a little bit cheap. But for an experiment, this is pretty successful! There are matching earrings for this, I'll get the photo at some point and add it in here. I've started bolstering my jewellery supplies in readiness for winter! I've found some absolutely gorgeous beads in amongst the usual run of the mill stuff over the last few days and can't wait to create something fabulous with them! In the meantime, I sat down and whipped up a new red necklace last night. Its nothing like I was actually setting out to create, but it just happened as I played with a few bits and bobs. I'm really pleased with it to! It's quite pretty, compared to my usual designs. Shocking photo sorry - self-portrait using my camera phone, at work with no mirror!